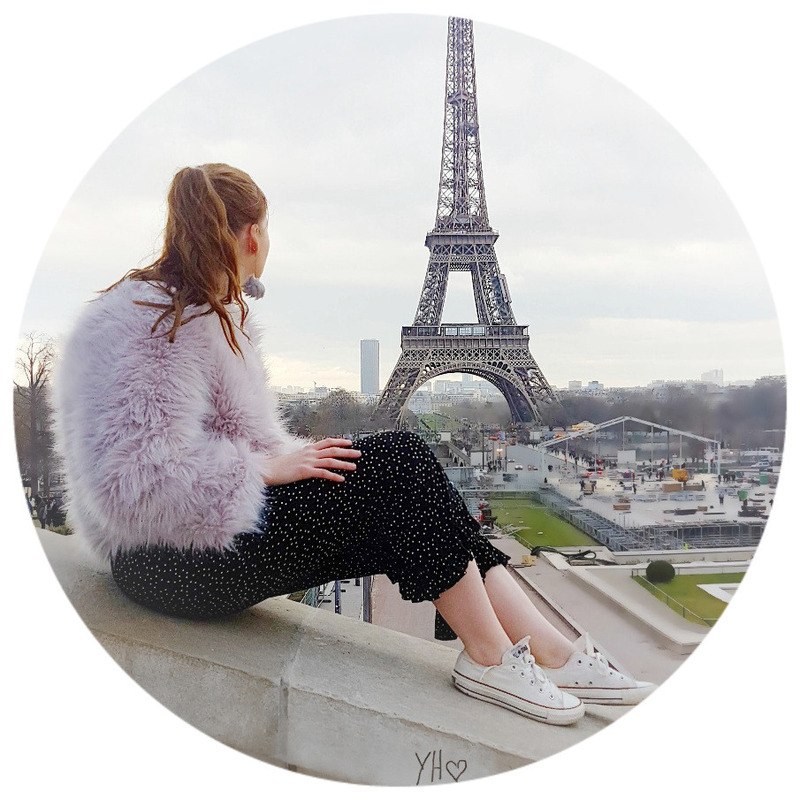 If you've been reading my blog for a while now you most likely will know of my crazy addiction to writing about beauty, travel, food and obliging how-to-guides. If we put all of that on hiatus, another much-loved hobby I enjoy getting into a deep discussion about is documentaries, true-crime, serial killers and the occasional thriller - I promise I am normal, I just like twisted, sinister things to watch. Please say I'm not alone?? Anyway's I am going off topic, as usual, I decided this year to start talking more about what I have been watching/reading recently on my little blog as it is something I enjoy talking about I'd say, 60% of the time. It means I now no longer have to bore my friends and poor boyfriend with my fascinations and long conversations. So to kick this off I decided to share What I've Watched On Netflix Recently because there has been a fair few series I have binged over the New Year and I decided to rate them out of 10. What would you do for love? Bookstore manager Joe meets graduate student and aspiring writer Beck at his bookstore and falls in love at first sight. Joe becomes obsessed with her and stops at nothing in getting rid of the obstacles that keep her from loving him. Long story short I loved this series, I think I binged watched it within a few days and could not stop recommending it to friends. It's very twisted and creepy, but also incredibly entertaining, a lot of 'on the edge your seat' moments. They have confirmed a series 2 as well! Behind the scenes documentary on the infamous unravelling of the Fyre Music Festival, created by millionaire Billy McFarland. Fyre was promoted as a luxury music festival on a private island in the Bahamas featuring supermodels, A-List artists and posh amenities...or so they thought. I went through so many emotions when I watched this documentary, at first I didn't think I would enjoy it, but when the story unravelled I was hooked. It's a well researched and descriptive documentary that's interesting to see how so many smart people can get pulled into an egomaniac situation. A young programmer begins to question reality as he adapts a sprawling fantasy novel into a video game soon face a mind-mangling challenge. You control what happens next. I loved the concept of being able to control how the plot unravels for the protagonist, but for me, it didn't work. I like to 'Netflix & Chill' so to speak, not Netflix & constantly press choices to decide the characters' fate. It felt more like a story-telling game than a Netflix episode and it did become irritating having to rewatch certain clips if your choices weren't correct. On October 17, 1974, 12-year-old Jan Broberg was kidnapped by her next-door neighbour and parents' best friend. This is a documentary about the true story of the Brobergs and what happens to their 12-year-old daughter. I love documentaries that stick in your mind for a long time and Abducted in Plain Sight definitely does just that. This was so unlike any other cases I have watched before and it was incredibly twisted and irritating as hell. If you haven't heard about this I suggest you look it up before you do so as it's disturbing to watch. Have you watched any of the above?? Now I'm not going to lie, when I wake up in the morning I sure as hell do not look like Jennifer Garner in 13 Going on 30, who rocks up to work in just a night-dress and some dainty heels. Girl envy right here. However, I do think incorporating some sort of night time routine into your life can definitely benefit you in the morning. There is still hope for me yet to wake up looking like Jennifer. Here are some things I do before I go to bed that really help benefit me in the morning and stop me from feeling like a walking zombie in need of blood coffee. Getting into the habit of coming away from your desk an hour or 2 before bed definitely impacts on the way you sleep. I've gotten into the routine of reading before bed, which probably still isn't as effective, but my mind is relaxed and isn't worrying about things. I find doing this allows me to fall asleep a lot faster. I've been drinking a cup of herbal tea or hot lemon water for a good few years now and can honestly say it's made a difference in my overall health. I always feel less sluggish, relaxed and cleansed when I drink either of these. I don't know if it's a myth, but having a hot drink an hour or so before bed definitely sets the mood before you go to sleep. Once I have removed all of my makeup and cleansed my skin, I like to pop my Origins Make A Difference Night Cream onto my skin, yes I said night cream, followed by some sort of treatment depending on my skin that day - 9 times out of 10 is a zit-zapper treatment because I have the skin of a teenager. 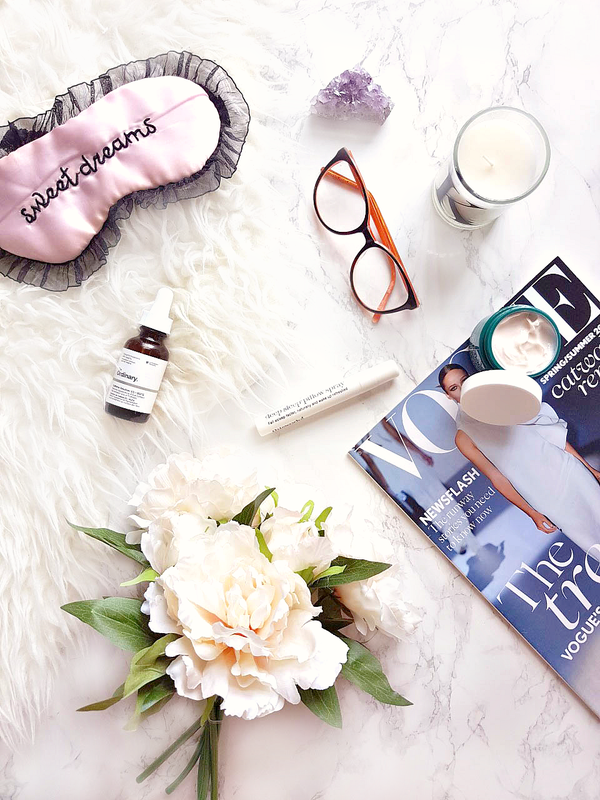 Having a skincare routine in the evening really helps to feel relaxed and ready for bed. Who'd of thought I'd have night cream though?? If I know I have a busy day ahead of me I will meal prep (who am I kidding it's usually soup), get clothes ironed and laid out and pack my bag the night before, that way my brain is able to relax when I am in bed and in the morning I am not rushing around like a headless chicken and forgetting something. There are a couple more minuscule things I like to do before I go to bed that do have I'd say an impact. One of which is to spray my bed with a sleeping spray or use the LUSH Sleepy Body Lotion, I mean it just puts me to sleep even moisturizing my body it's such a chore in itself. I also like to reduce the brightness on my phone so my eyes aren't concentrating so hard on whatever it is I am looking at. Do you have any bedtime habits?? I could have sworn Christmas was yesterday and I was eating my way through a tub of Quality Streets whilst watching a classic festive film. Time really does run away from you. January was a blip. Now here we are in February - chapter 2 out of 12 and Valentine's Day is literally only days away, which means cutesy heart-shaped chocolate will be on offer a day later - silver linings and all that. I've never really been that into Valentine's Day personally, my boyfriend and I usually buy each other a cheesy pun-related card and cook some sort of concoction involving spaghetti and meatballs and re-enact the iconic Lady & the Tramp scene. I'm kidding, although spaghetti is involved - in a none intimate sort of way. 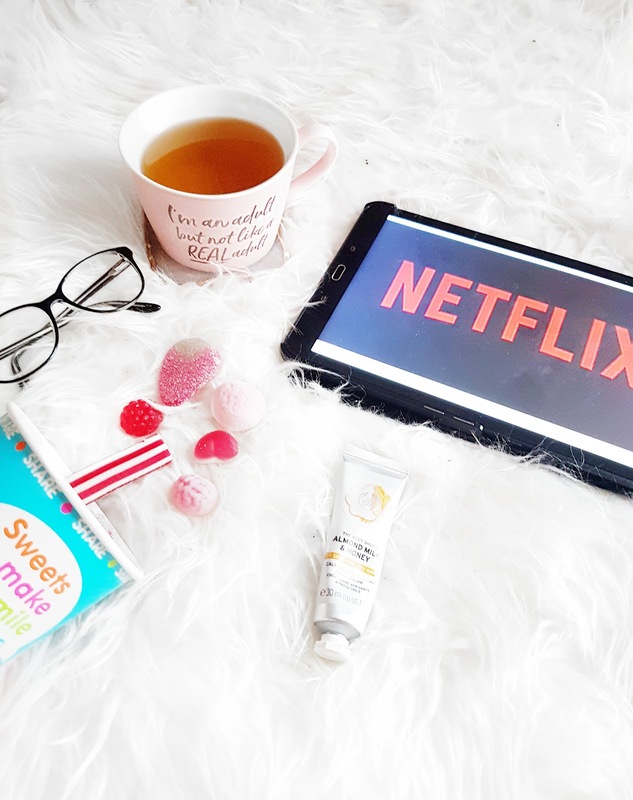 Valentine's Day is supposedly a day of love so whether you are single or just fancy a cosy night in, having some 'me time' is an important thing to do every now and then, so why not do it on Valentine's Day? I have put together a little light-hearted post on how to create the perfect galantines night in and have a night of relaxation. P's buy a bath tray from Amazon; it has literally changed my life and increased me to drink in the bath, oops. First things first you got to prepare the bath, so light some candles and sprinkle them all around your bathroom and then dim the light. You then want to pop some sort of bath product in the tub, I like to add some bubbles and some Himalayan bath salts and create a bath-cocktail. You could even go the extra mile and buy a boat and be Chandler from Friends. So now your bath is ready you then want to grab some skin pampering treats, so a face mask, body scrubs, cleansers etc. When I want to treat my skin I like to use the Glossier Milky Jelly Cleanser to start off with, as it's so soft and kind to my skin. I then pop on some of the Herbivore Blue Clay Face Mask - perfect for oily spot prone skin. I also like to bring some other essentials like a cup of herbal tea or pink gin if I really want to push the boat out. At the moment, I am enjoying reading in the bath - it's my therapy. 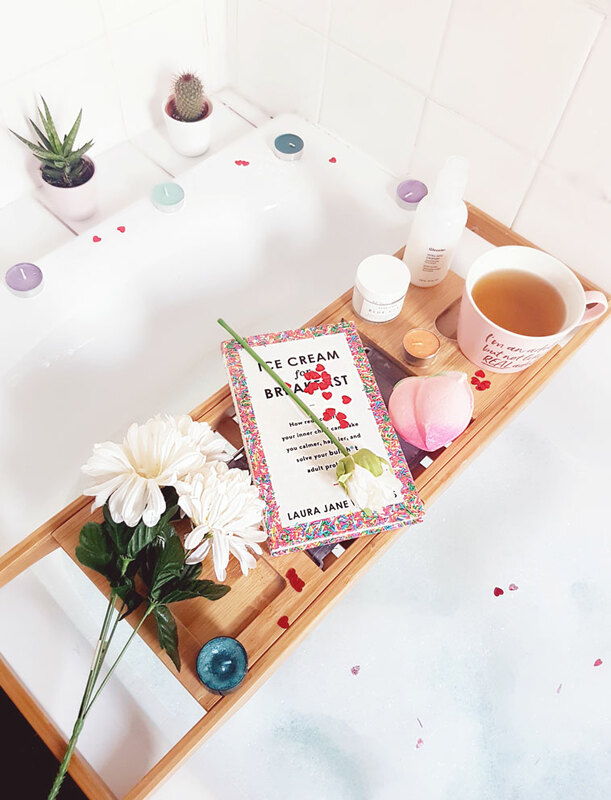 The book I am enjoying at the moment is Ice Cream for Breakfast by Laura Jane Williams, which is such a witty, humorous and inspiring book that is so easy to dip in and out of. As I previously mentioned time does run away from me, perhaps my excessively long baths are the reason? Anyway's, once fully pampered and cleansed I then go onto either cooking or ordering something yummy to eat. If I really want to treat myself I will order a Chinese or a Wagamama's *thank you Deliveroo for delivering this into my life*. Or I will cook something really tasty, but 9 times out of 10 if I want to treat myself it's usually takeout. So you're in your cosy pyjamas and stuffed with food, now's the time to do you. Whatever it is you enjoy doing to relax whether that's watching a good Netflix series, in my case; it's been a not-so-relaxing True Crime series. Read a book, play a game, whatever it is try and spend more time in-the-moment and less time on your phone scrolling Instagram. Phones are so distracting nowadays, I've spoken about this in my How To Digital Detox post here if you are interested. I find it so bizarre that 10 years ago I would be staying up past midnight, trying to make the most of time, whereas now I am usually in bed around 10 and asleep by 11 at the latest. Oh, how things have changed. I love my bed and I love early nights, I am one of these people who if I don't get 8 or more hours sleep I will probably be running on coffee and attitude for the next day. Not to sound like your doctor, but sleep is so important it helps reset your brain and relaxes your body, which is what you need to complete a cosy Valentines or any sort of pampering evening night in. What are your Valentines/Galantines plans?? Whoever thought of the brilliant idea to put together a 24-day advent calendar full with beauty goodness deserves a pat on the back and a years supply of chocolate chip cookies. Beauty advent calendars are amazing for us blogging chums who just love discovering new and exciting beauty products or in my case finding a few new bathroom shelf favs. For the last 3 years, I have treated myself to a beauty advent calendar with a variety of skincare and makeup brands. The ASOS Beauty Advent Calendar has been a favourite of mine for the past two years and every beauty discovery I chat about in this post is in fact out of their last two calendars. They always include iconic brands we have all heard or loved and everything you receive gets put to good use. Although beauty advent calendars can cost up to a month's worth of rent or in my case eating cuppa soup's for lunch until next payday. They are worth it if you are interested in trying new products out or just have a substantial slight addiction to beauty. I have always been a fanatic of the brand Alpha-H especially their Liquid Gold that has saved my skin over the years from uninvited face spots. So I was thrilled to open a door and discover the Alpha-H Clear Skin Daily Facial Wash. At the age of 25, you'd think my skin would be through with hormonal spots, right? Well, no but this stuff does help maintain the unfriendly beasts by reducing the redness and drying those suckers out. This facial gel cleanser contains tea tree which is, of course, amazing for spots. I have rapidly become a fan of this product and will definitely be purchasing the full size and adding it to my skincare shelf. ...Whilst we are on the topic of cleansing I might as well kill two birds with one stone and mention my Foreo Luna Play Cleansing Brush that I use to buff the cleanser in with. Firstly let us just address the fact I received a pink mini Foreo Luna Cleansing Brush in one of my ASOS calendars! And secondly, this is such a sweet little brush perfect for travelling with and so easy to use. I don't use this every day, but when I do my skin feels so soft and luminous. Cleansing brushes tend to be quite abrasive on my sensitive skin, but this little Luna is just so relaxing and gentle on my skin I can see what the fuss is about now. The Clinique Moisture Surge Gel couldn't have come at a better time as I was on the hunt for a new moisturiser. Finding the perfect moisturiser is like finding the invisibility cloak in Harry Potter - rare and only a few have found it. My skin is a combination of everything so you can imagine the struggles I have to deal with. This moisturiser is great when my skin is going through a bit of everything, this restores balance to my skin and the gel texture helps keep my skin feeling refreshed. 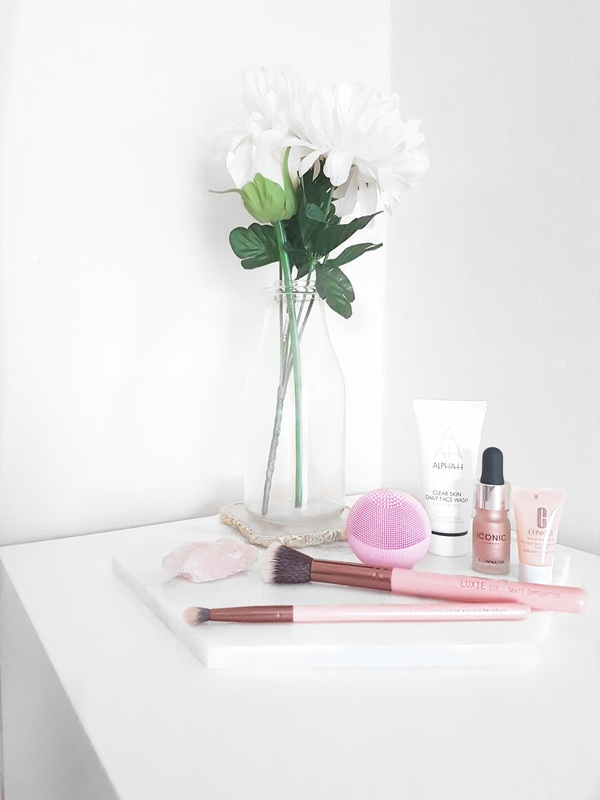 If you've been reading my blog for a while you will know it's very rare I mention makeup brushes, purely because I'm a Beauty Blender kind of gal and loyal to my Real Technique brushes. However the past two advent calendars ASOS have included the Contour and Tapered Blending Brushes by Luxie. I like to use the blending brush for my eyeshadow crease and the contour brush for mostly bronzing my cheeks. These brushes are cruelty-free which is always a good thing and they're so soft and easy to blend makeup on the skin. I did a little in the head squeal to myself when I opened a door to discover a mini-sized bottle of the Iconic London Drops. After seeing these drops posted all over social media the easily-influenced beauty fanatic that I am wanted to buy these, but I knew if I did I would never finish the bottle, as it's very rare I complete a liquid highlighter. So this was perfect to receive! If you are a swot for highlighting you will know how amazing these liquid drops are. It can be added to a foundation, primer or moisturiser for super-versatile glow, but even on its own you only need the tiniest amount and your face is instantly glowing like Edward Cullen, but in a lot less subtle way. Overall, I am so happy that I have managed to discover some amazing products in my beauty advent calendars, not only because it would be a waste of money otherwise, but because I have found some keepers that are now apart of my skin and makeup routine that has made a difference. Definitely would recommend beauty advent calendars or even beauty subscription boxes if you want to expand your love for beauty. What has been your favourite product in a beauty calendar/sub-box?? 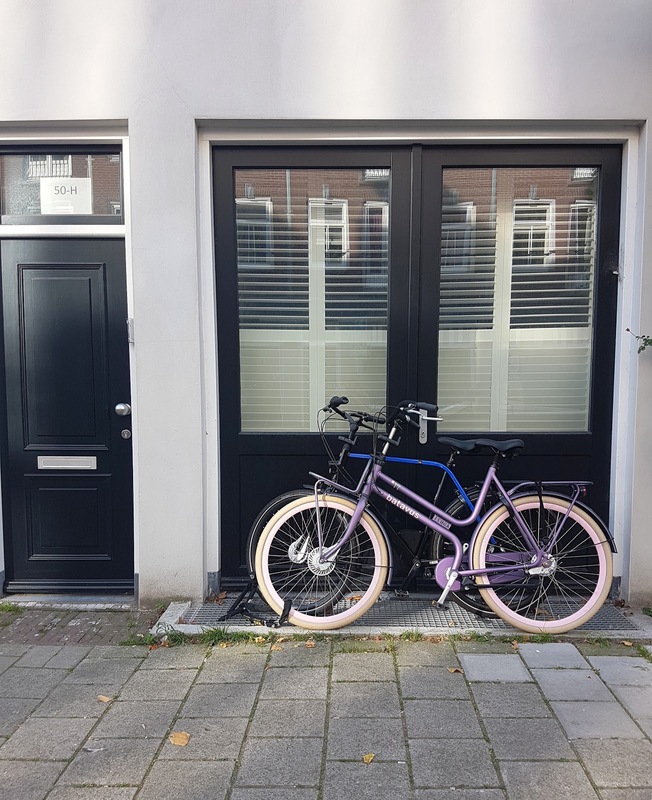 Amsterdam is the perfect city to just chill the hell out by cycling around the canals or getting lost around the centre. All the exploring and site seeing is amazing, but it really does give you a huge appetite. One of my favourite things to do before I visit a city is research all the amazing local cuisines and explore the quirky hidden foodie spots. 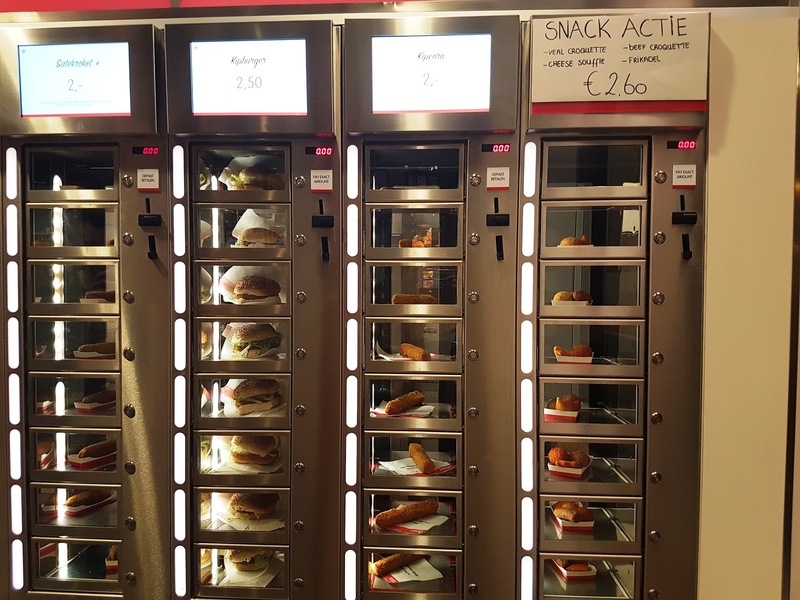 Here I have put together a guide on all the snacky-foods I was able to try during my time in Amsterdam or spots I would recommend that isn't on a typical Dutch food guide. 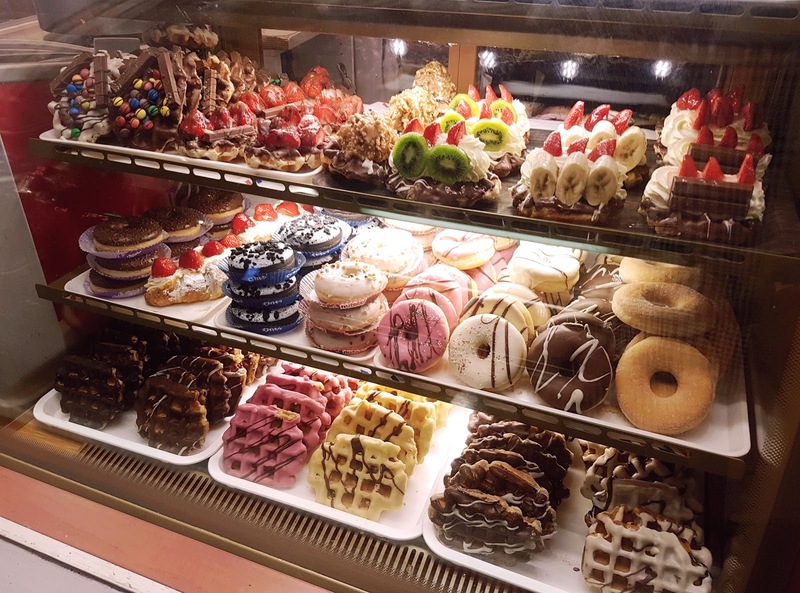 Van Wonderen Stroopwafels - A very Instagrammable cafe to try that makes Stroopwafels in giant form and you can add any sweet toppings on top. I didn't try this myself personally, but I witnessed so many others do so and I kinda wish I did as it is such a quick and easy thing to have. Perhaps on a lunch break or if you don't fancy waiting in queues for food just pop a euro or two in a machine and grab a burger. Such a cool thing to have and definitely something worth checking out on your travels. 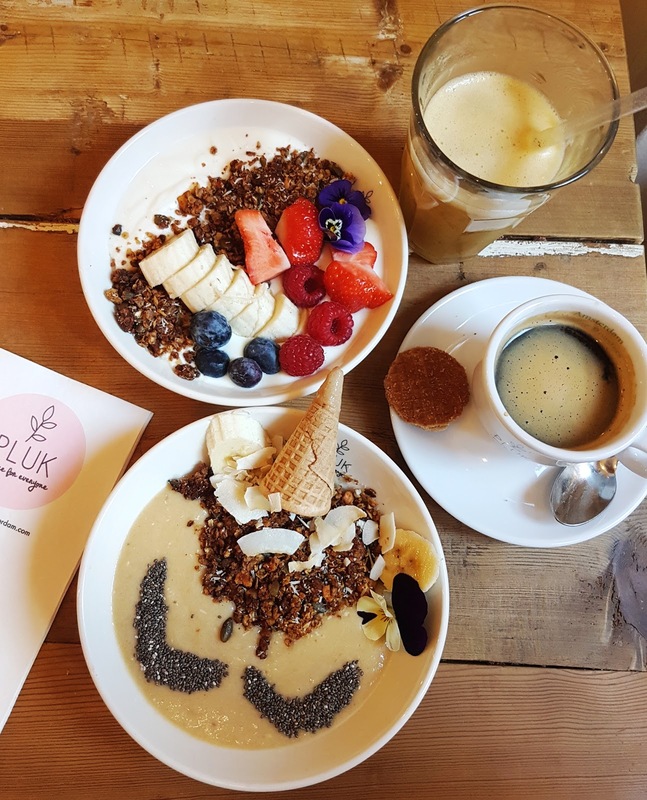 Something I saw quite frequently on Instagram was this quirky, chic cafe and its amazing picture-esc smoothie bowls. Obviously, I was sold to try the unicorn bowl and I can confirm it was amazing and so healthy. They also sell delicious pancakes, salad bowls and the cutest little snacks at the counter. 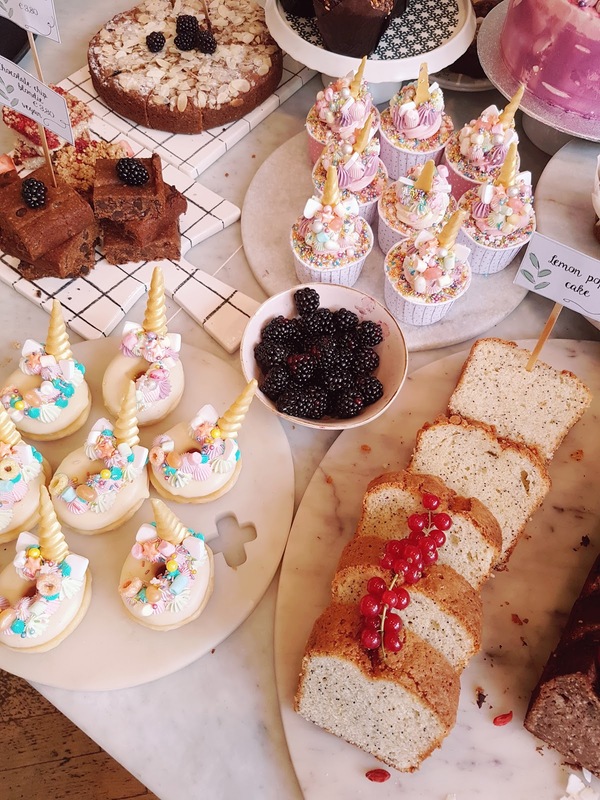 It is definitely a good spot to come for brunch or even just to take out a scrumptious unicorn doughnut. As well as selling delicious, photo-worthy foods, they also sell cute home decor and accessories, which I believe you can buy off their website. This cafe was probably a highlight for me and somewhere I would definitely visit again. If you are into freakshakes or just want a sugar-overload which we clearly did, definitely check Corner Bakery out. 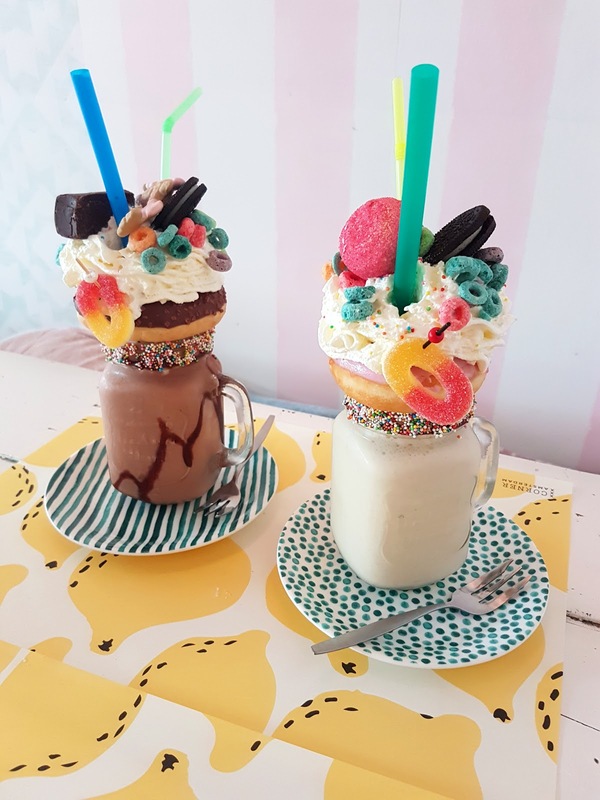 They do of course other breakfast foods, but I think the milkshakes are what draws a lot of attention. 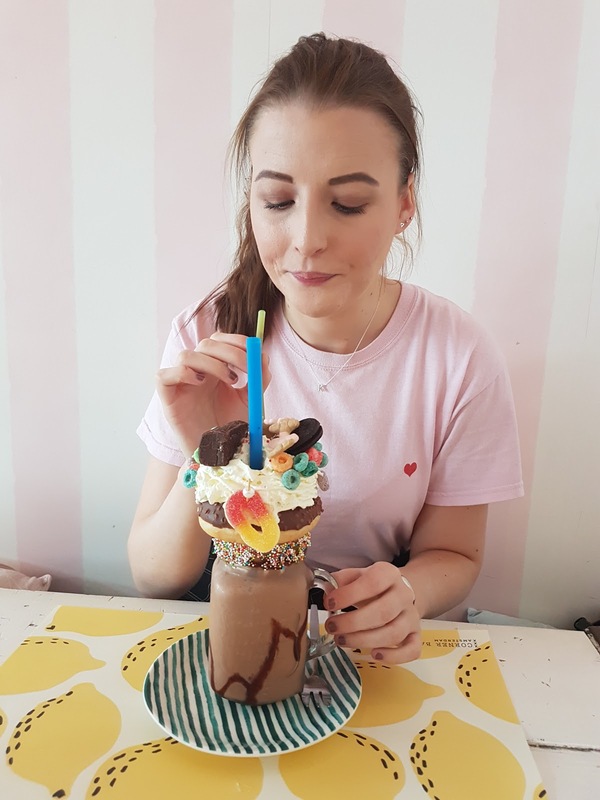 I mean why would you not want to eat your weight in cream and all sweet things as well as devouring a delicious milkshake at the end? I personally could not eat all mine I had to scoop the cream off and my boyfriend finished the drink. It tasted amazing and definitely something you have to try at least once. 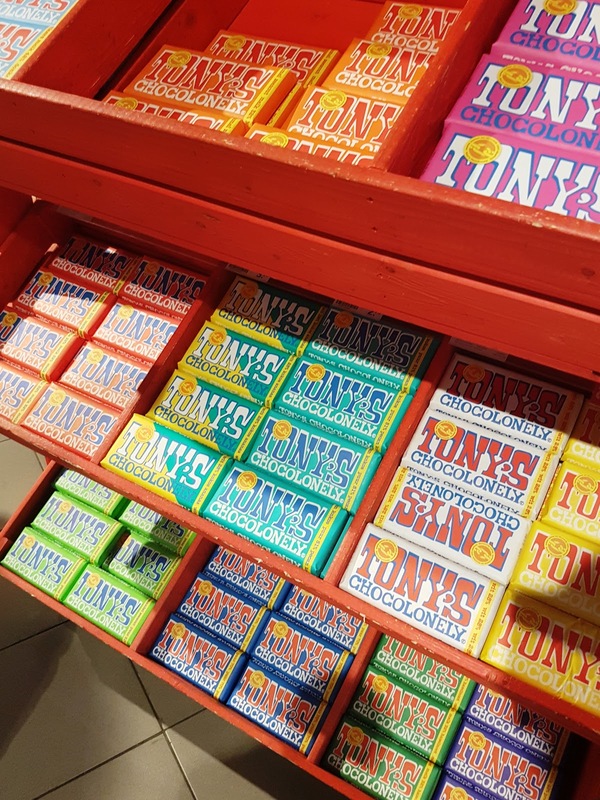 When visiting local supermarkets my boyfriend and I was constantly coming across this chocolate brand. It reminds me of Wonka chocolate bars from the packaging, so we decided to try a few flavours. I went for milk chocolate caramel with sea salt and my boyfriend went for white chocolate raspberry sugar crack. Both of which tasted absolutely amazing! I loved the chocolate so much I grabbed some through the airport on my way home. Definitely try this chocolate they do so many amazing flavours. 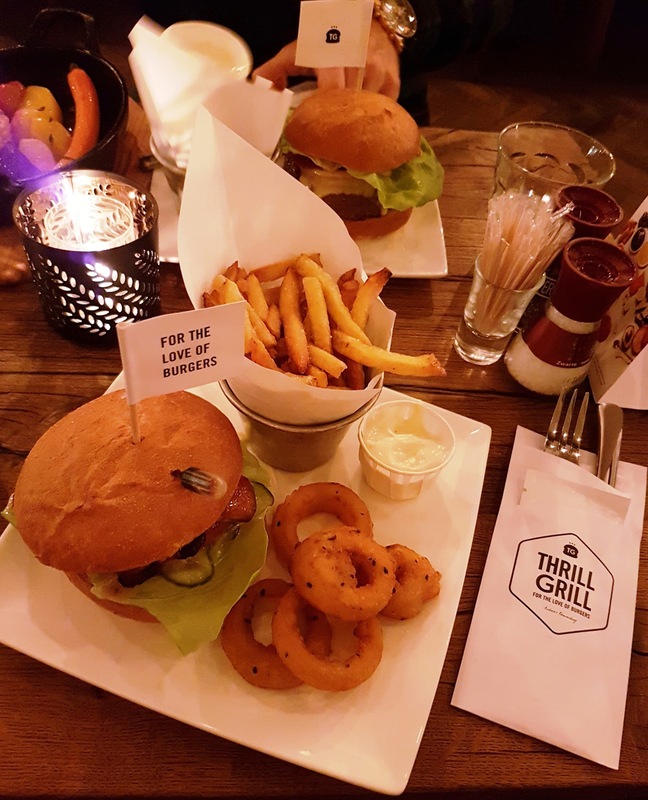 One place we visited for dinner was Thrill Grill, a restaurant that sells amazing burgers with delicious sides. This place was recommended when we looked up top burger places to try in Amsterdam and it did not let us down. The atmosphere was very chilled and the food was so cheap and tasted so good. For a burger and two sides, it cost 15 euros. I went for the chicken burger with wasabi sauce and a side of fries and onion rings. My boyfriend went for a classic burger with fries and seasonal veggies. My burger came with a drip of soy sauce you squeeze into the bun for extra flavour, which was pretty cool! Definitely check this place out if you love burgers, they also sell organic black buns and vegan options too! We tried so much food in Amsterdam that I am recovering from withdrawal symptoms from those waffles. 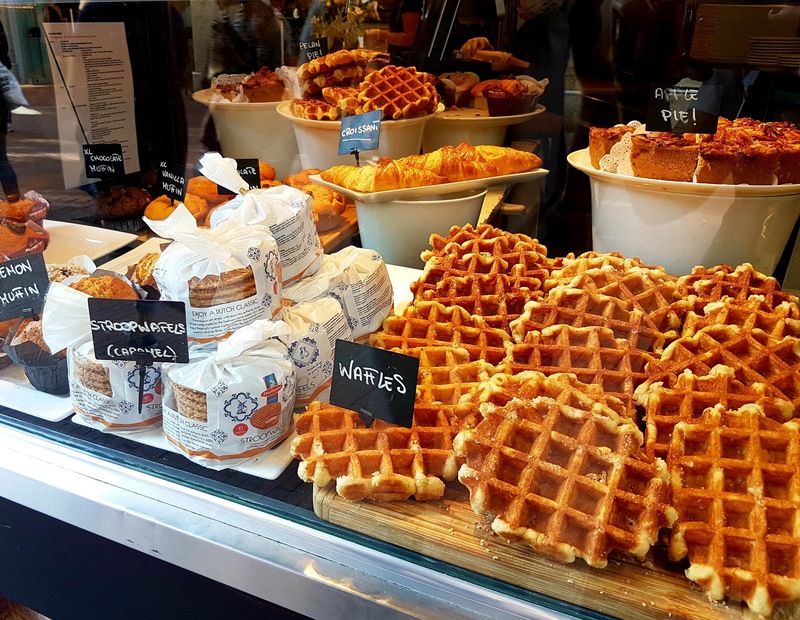 We didn't always try your typical Dutch foods as we wanted to give hidden gems a try as well. But other Dutch foods that are recommended to try are Herring, Poffertjes (baby pancakes), croquettes and Heineken Beer. What food do you recommend in Amsterdam? ?